While male and female emperor penguins are virtually indistinguishable in size, their behavior is distinctive, particularly around mating season. 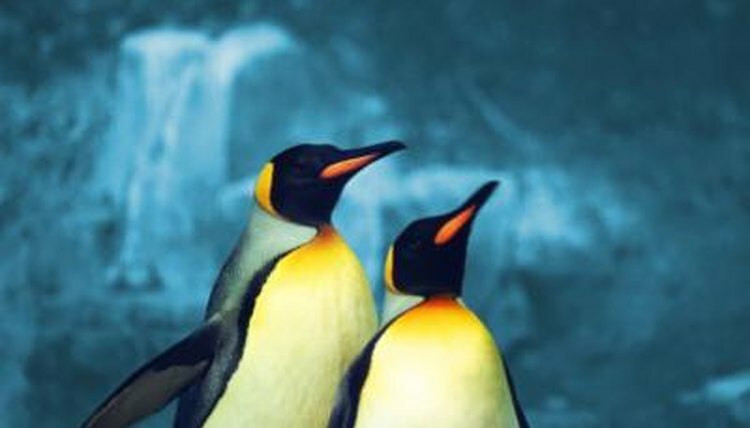 The female population is significantly higher than the male population -- about 60 percent of emperor penguins are females -- so they must compete for males. Despite the lopsided ratio, the males work to attract females, not the other way around. During the breeding season, emperor penguins pair up and remain monogamous, though they may change partners with every new year. When they are ready to find their mates, the male stands in one place and performs a ritual meant to attract females, during which he repeats a sound called a courtship call. Females move through the colony and respond to these sounds with courtship calls of their own until they form couples. Once eggs are laid, the differences between male and female emperor penguins become even clearer -- the females leave the colony. Their partners stay behind and keep their eggs warm, while the females travel about 50 miles to the coast, where they hunt in the ocean and feed. The females travel back to the colony around hatching time, where they regurgitate their food to feed the hatchlings and give the males an opportunity to travel and hunt for themselves. On Average How Long Does a Queen Bee Live? What Climate Do Wasps Live In? How Long Do Emperor Penguins Care for Their Young? Do Carpenter Bees Have Stingers?